This is a very nice photograph of the Headquarters Building also known as the "Boot". Looking at the shape it isn't hard to see where it got it's nick name. 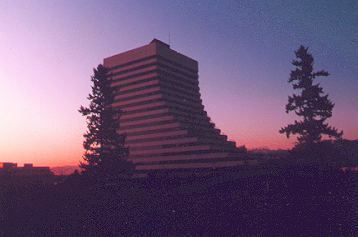 This building is the corporate headquarters for TELUS Communications. The "Boot" is the home of the Club's voice repeater, VE7TEL/VE7ESR. The reason for the dual call sign dates back to when the members of the Totem Amateur Radio Club decided to permit the TPARC to use their repeater frequency when the Totem repeater became disabled. The two clubs decided to share the one frequency pair and the TPARC would take responsibility for maintaining the repeater. A phone patch installed on this repeater. 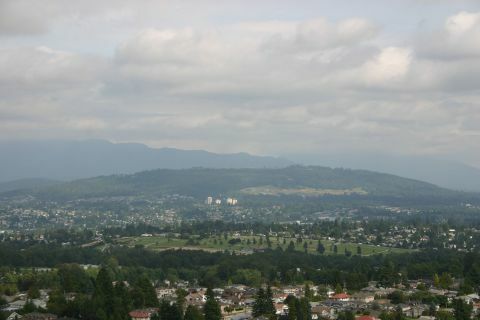 The coverage of this repeater can be heard as far away as the eastern end of the Fraser Valley and in most parts of Victoria. The phone patch is open to Totem club and TPARC members only. The photograph above is the VE7TEL voice repeater. It is a standard Western Radio rack mounted unit producing approximately 35 watts of power. Our UHF repeater is a Harris, like the trunk radios, modified for voice operation. 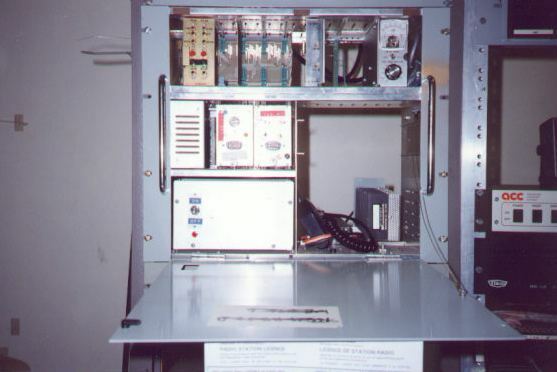 It is linked to the VHF repeater through a Link Communications repeater controller. 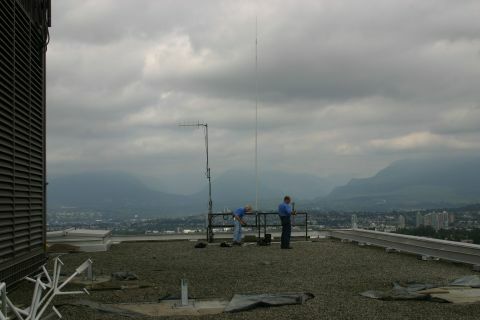 Here Gerry Douch, VE7CSG, is installing the packet station. Again, the package is much the same as the other sites. A VHF and UHF "Drop" and two Trunk radios. 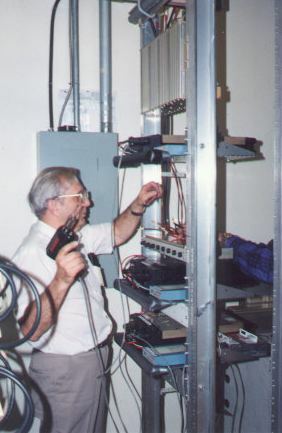 This was the second packet station to be installed and is still used to test new concepts. The radio room sits in the mechanical room at the top of the building under what has become to be known as the "Wedge". 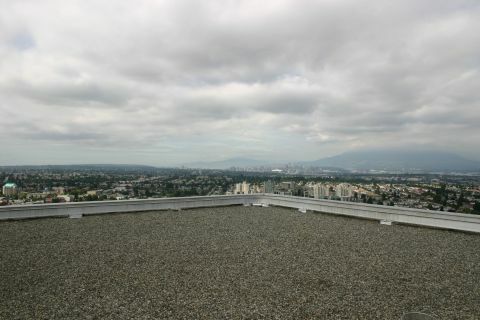 Above is a picture of the vew towards downtown Vancouver. 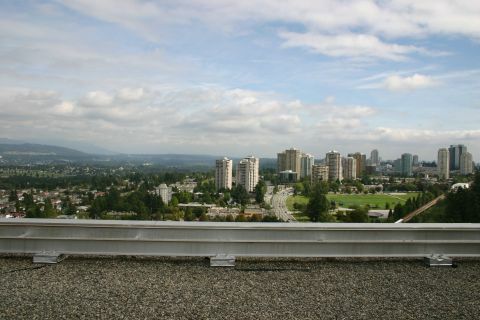 Below is the view toawrds Metrotown. TPARC has a high speed TCP/IP wireless link in partnership with BCWARN and VECTOR, it is fed from Simon Fraser University. Below is the view of SFU. Some of our link and test antennas are shown in the picture below, including our HF whip antenna. 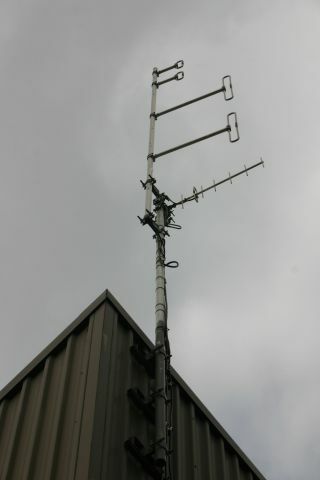 Above is the combination VHF/UHF repeater antenna used by our repeaters, as well as the link antenna out to Haney. 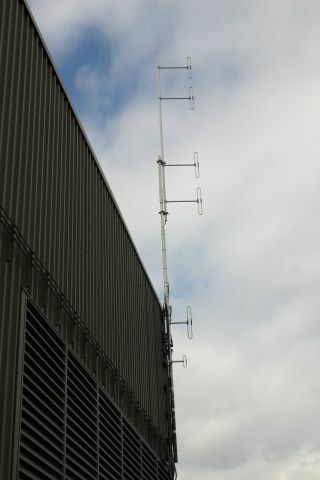 Below is a picture of the TELUS Autotel antenna that we share the site with.